Washington, DC – a city known worldwide. With iconic buildings, wonderful museums, numerous food options, parks, and entertainment options, Washington, DC is a perfect travel destination in the USA. 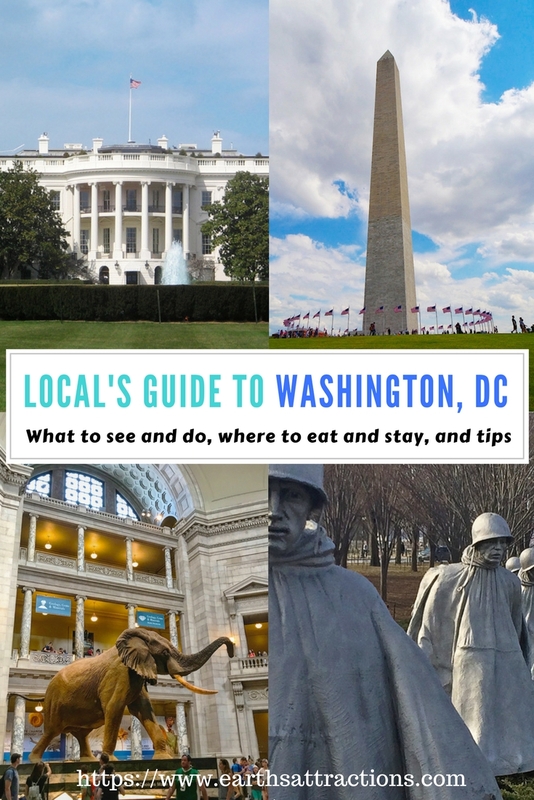 Discover the famous attractions in Washington, DC, off the beaten path things to see and do here, where to eat in Washington and where to stay, all in a local’s guide to Washington, DC written by Stephanie from Road Unraveled. 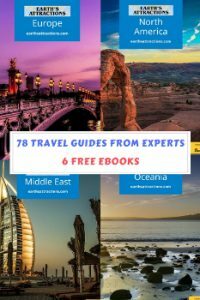 The complete travel guide to Washington, DC is part of the free travel guides series on this blog. Washington, DC is not just the United States’ capital and one of the largest cities on the USA’s eastern seaboard. It’s a budget traveler’s paradise. 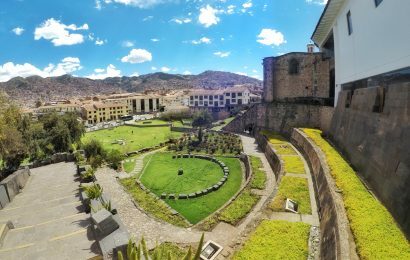 It’s a history lover’s utopia. It’s a foodie’s dream come true. And if you haven’t spent time in The District, it should be the next place on your vacation bucket list! 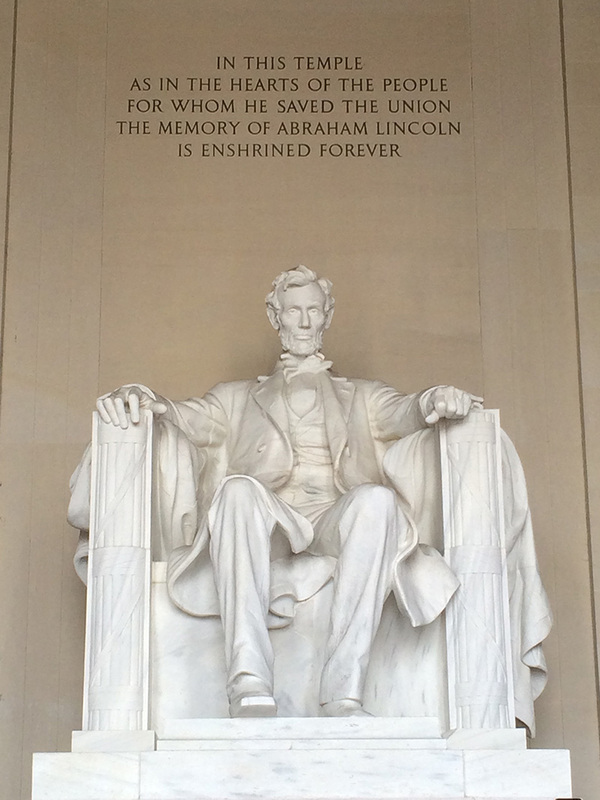 A trip to Washington, DC cannot be complete without a walk amongst its famous monuments and memorials. 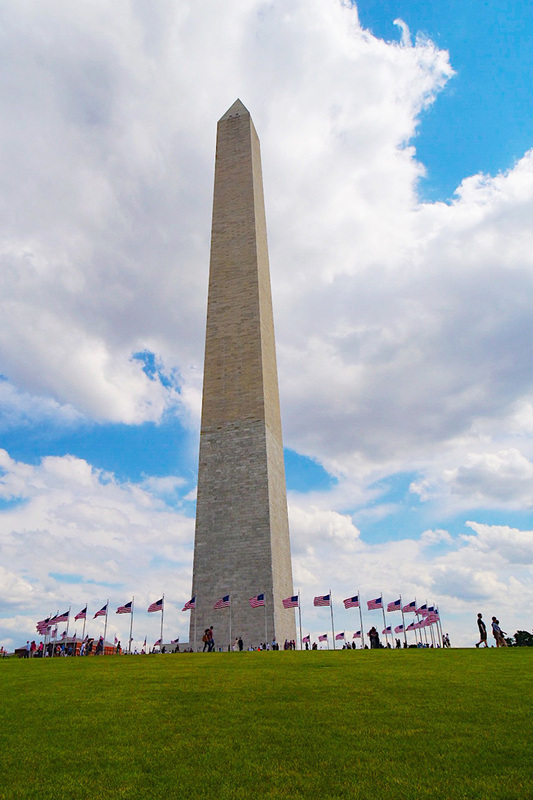 Start your walk at the most famous of them all, the Washington Monument, which stands just over 555 feet (170 m) tall. 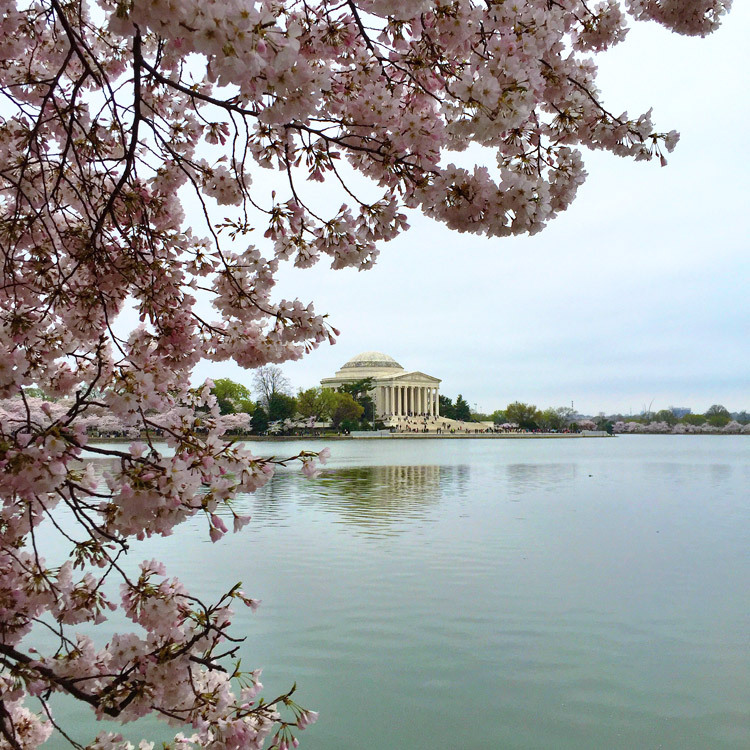 From there, continue toward the Tidal Basin to the Jefferson Memorial, where a bronze statue of the nation’s third president stands under a marble dome. Continue around the Tidal Basin toward the Martin Luther King, Jr. Memorial, one of the newest monuments in the city. 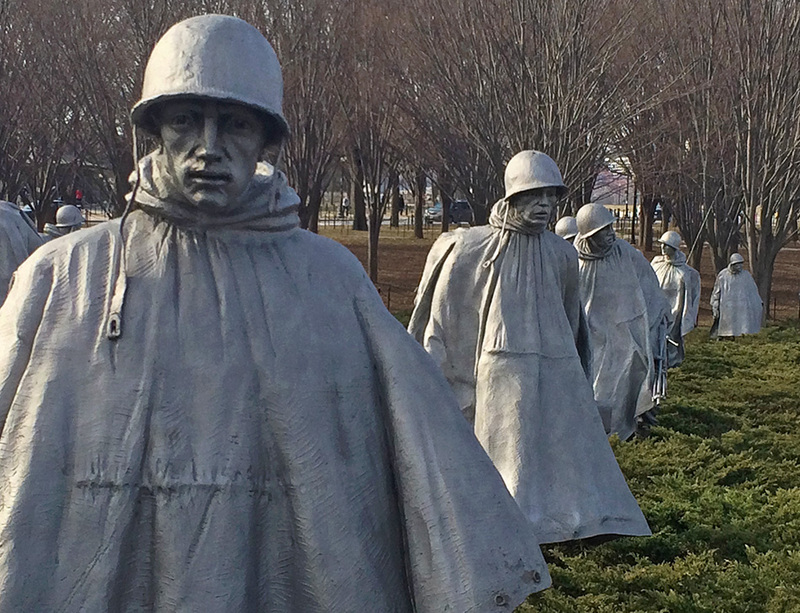 Pass by the Korean War Veterans Memorial, where 19 stainless steel statues of soldiers dressed in combat gear will surely command your attention. The iconic Lincoln Memorial will be your next stop; climb the steps for a great view of the Reflecting Pool (and the Washington Monument in the distance!). Finally, walk past the Vietnam Veterans Memorial and take note of the more than 60,000 names of servicemen who were killed during or missing after that war on your way to the World War II Memorial. Once there, you can rest for a while by the fountain and take in the symbolism reflected throughout the area. 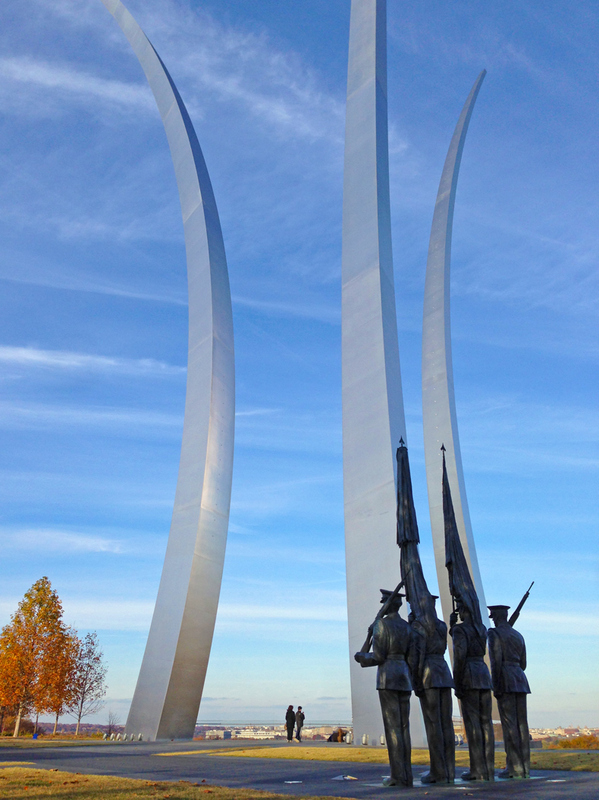 DC is more than just impressive monuments! 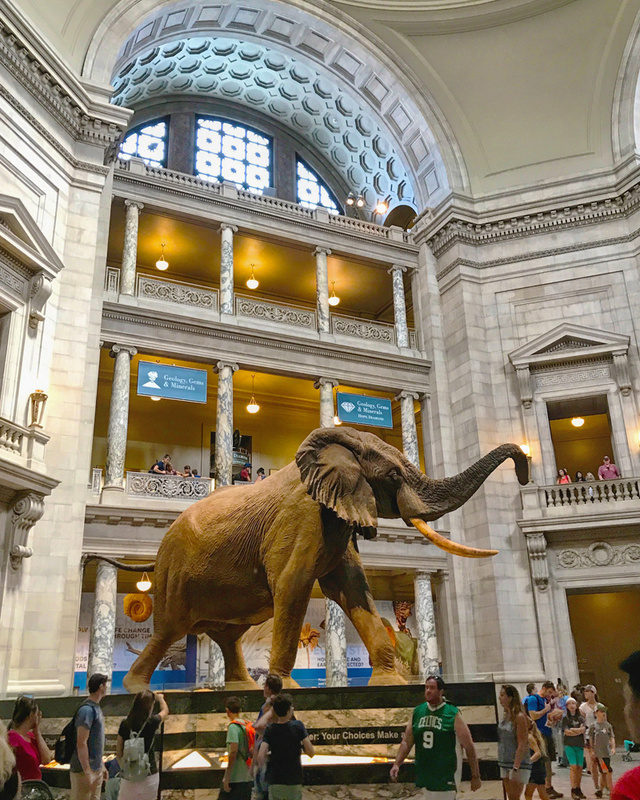 Be sure to head indoors to check out a few of the museums that line the National Mall. The American History Museum, the Air and Space Museum, and the Natural History Museum are all popular favorites, and don’t miss the National Museum of African American History and Culture, which is one of the newest museums in the city. Best of all, like the monuments, visiting any of these museums is completely free! If you still have a little bit of energy left, walk by the US Capitol Building for a glimpse of where some of the most important decisions in the country are made. A final, significant stop to make is the White House, which serves as the home to the sitting president. 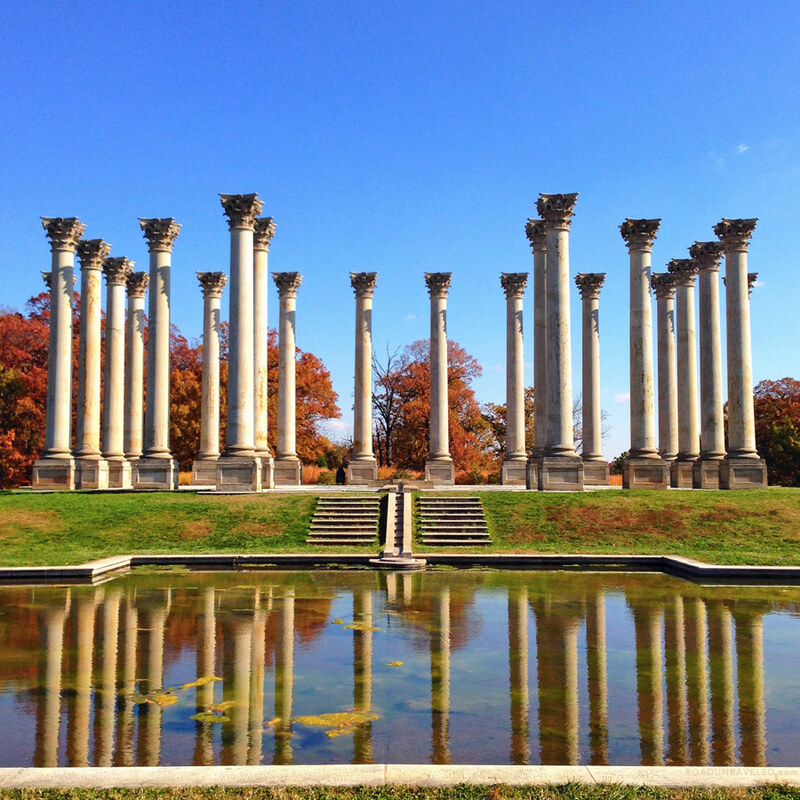 If you want to escape the crowds and seek a little more peace, visit the Capitol Columns at the National Arboretum in Northeast DC. The columns were originally part of the Capitol Building, but they were removed and relocated to this very tranquil spot. 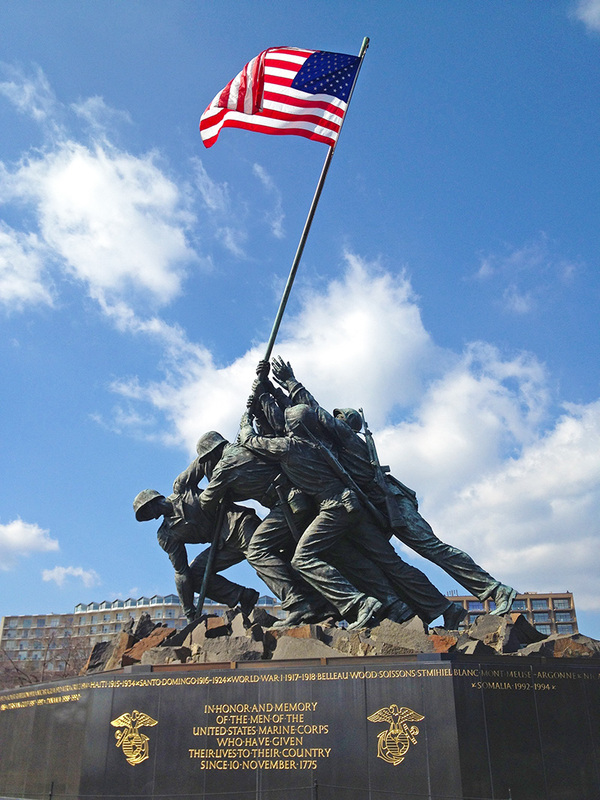 Leave DC for just a bit to see two other monuments—the Air Force Memorial and Iwo Jima—which are in Arlington, Virginia and don’t draw the same tourist traffic as monuments on the Mall. If you are looking for a few more indoor activities check out Freer Gallery of Art, which specializes in Asian and American artwork, and the National Archives, where you can see the USA’s original Declaration of Independence, Constitution, and Bill of Rights. The Library of Congress is also open to the public with some great exhibits. 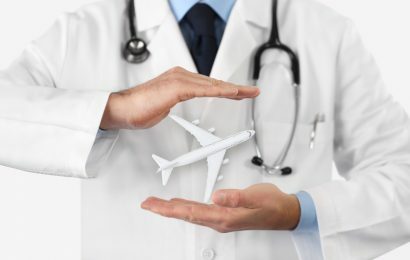 If you need some fresh air, stop by Gravelly Park, which is close to Washington Reagan National Airport. The park is centered under the path most flights take to land or take off from the airport, which gives you a first row seat to aviation in action! Washington, DC has hundreds of great restaurant options. If you want an iconic meal, look no further than Ben’s Chili Bowl, where everyone from actors to presidents have enjoyed a chili half smoke and some cheese fries. Old Ebbitt Grill is a great choice for politicos who are hoping to see an elected official or two, as many of them have dinner or drinks there after a day on Capitol Hill. If you want to try something new, DC has a great international food scene including Ethiopian food at Dukem, Balkan cuisine at Ambar, or ramen at Toki Underground. Founding Farmers is a great choice for modern American cuisine—don’t miss the fried chicken and waffles! If you just want a great cup of coffee, Compass Roasters is a wonderful local chain. For dessert look no further than Baked and Wires or Co Co Sala, both of which make delectable treats. 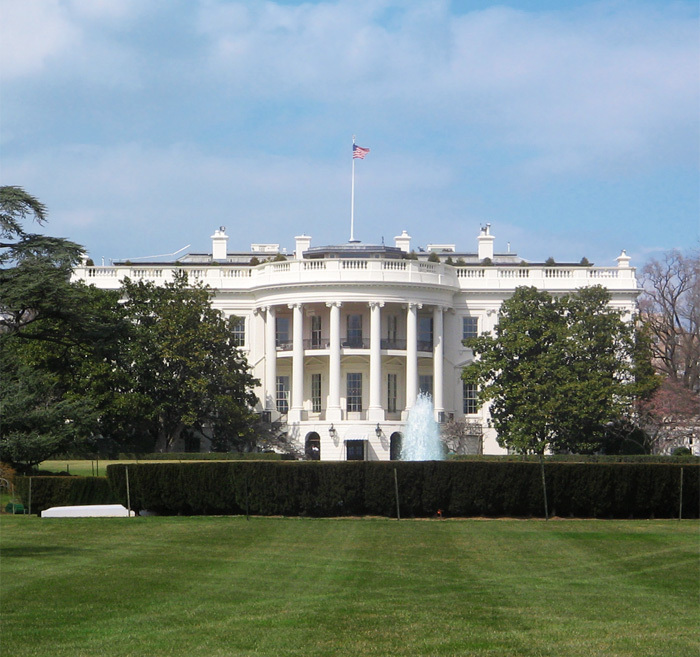 This local’s travel guide to Washington, DC, continues with accommodation options. You’ll have plenty of hotel choices in DC; a few of the best are the Kimpton Hotel Monaco (convenient and stylish with a great wine happy hour), the Crowne Plaza (great location and nicely decorated), and The Jefferson (a luxury hotel with free wifi and beautiful rooms). There are plenty of hostels in DC as well, including City House Hostels, HighRoad Hostels DC, and the DC International Hostel. Amenities for the hostels vary, but most include TV lounges and the option to have a private room. 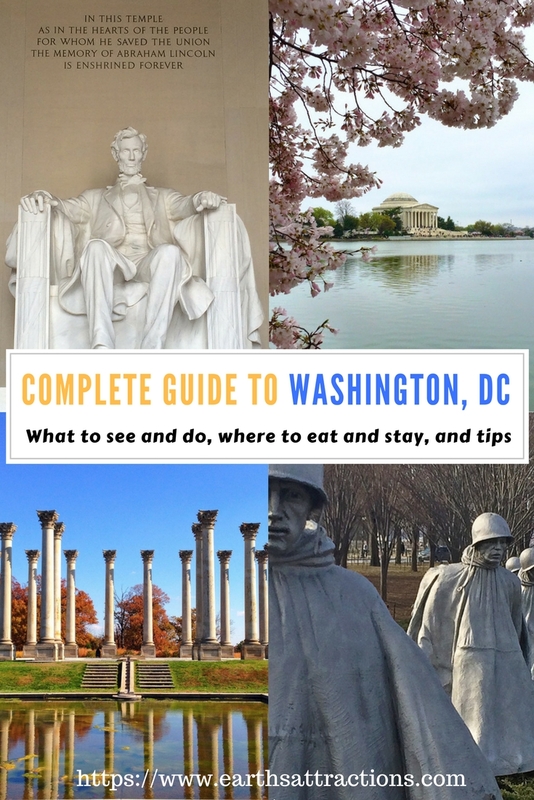 To make this article a complete travel guide to Washington, DC, I am sharing my best tips for visiting the city. Washington, DC’s Metro system is a subway that will take you to most of the places you will want to visit. Be sure to purchase a reloadable SmarTrip card at any station; for $10 you will receive your card preloaded with $8 to take you on your first trip or two. The price to ride the Metro varies depending on the length of your journey, so use the table on each SmarTrip kiosk to determine how much your ride will cost. Take note of peak fares, which coincide with rush hour (the busiest travel time)—prices will be a bit higher then! Also, remember to stand to the right when riding an escalator—if you would prefer to walk up the escalator you must do so on the left side! 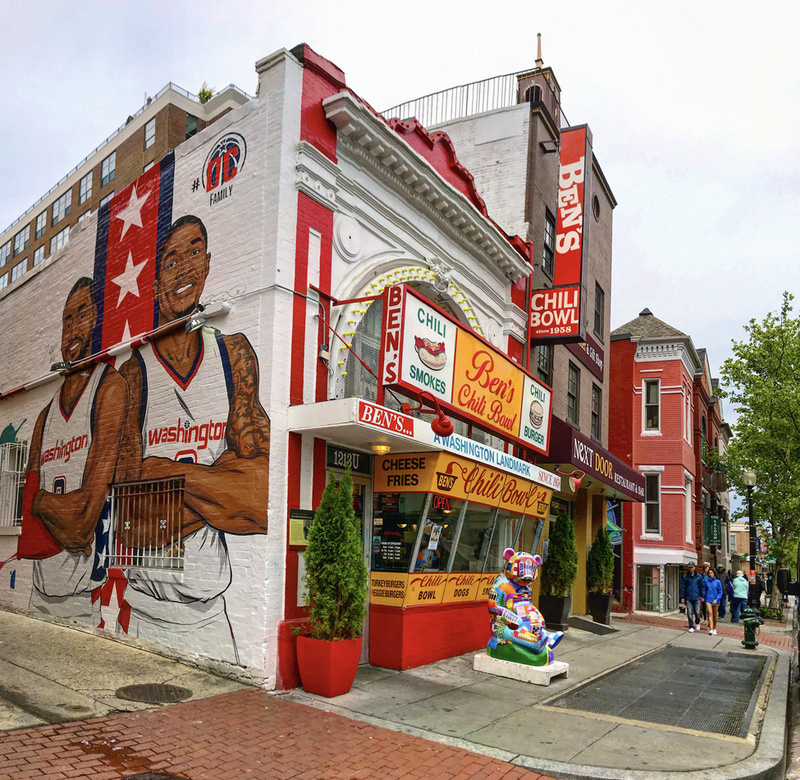 Most of DC’s famous attractions are in the Northwest quadrant of the city. While DC is, for the most part, a safe city, stay in the more populated areas of the city like Georgetown, Dupont Circle, and Chinatown at night. DC’s Southeast neighborhoods are primarily residential and sometimes considered more dangerous than the more tourist-friendly parts of the city, so your visit likely won’t take you there. Pay attention to the weather! DC is very hot and humid during the summer months, but the museums are air conditioned. Wear sunscreen and a hat, and bring a sweater for the times you are indoors. Similarly, DC sees a decent amount of snow during most of our winters, so be prepared for cold temperatures when you are outside. Many museums in DC are free to the public, but not all of them. Newer museums like the Newseum and the Spy Museum charge admission, so if you are on a budget you may need to decide if you will visit those spots. As you can easily see from this complete travel guide to Washington, DC, the city incredible. 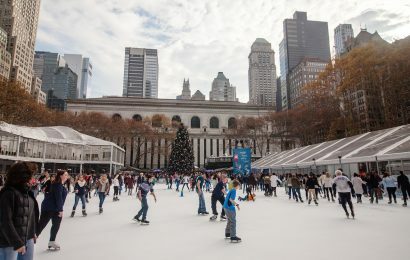 Your visit is guaranteed to connect you to new ideas, great food, and plenty of opportunities to try something new or enjoy a favorite activity. Whether you are visiting for the first time or coming back for a new experience, DC will definitely provide a trip to remember! Stephanie is a full-time talent development consultant and a part time traveler. With her husband Adam, she wants to inspire people to maximize their vacations and see as much of this amazing planet as possible! Their blog, Road Unraveled, is dedicated to untangling some of the challenges that come with planning and taking trips. Stephanie strives to prove that you can balance your career and home life with journeys that weave through foreign cities and nearby towns. Follow her travels on Facebook, Twitter, and instagram too. Awesome Pictures ! Great Information. Okay but what about Hamilton references places? Library of Congress, Treasury Building! I think I would love to go to these places as well, they seem to hold so much significance! I used to be very pleased to search out this web-site.I wanted to thanks on your time for this glorious learn!! I definitely having fun with every little little bit of it and I have you bookmarked to check out new stuff you blog post.